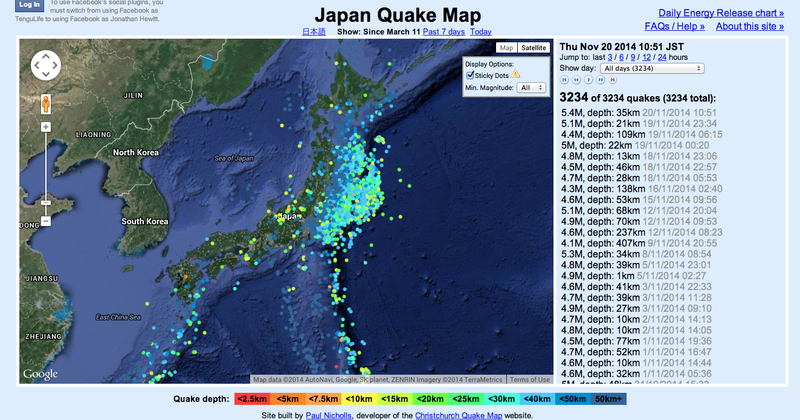 On Wednesday we experienced another aftershock in Japan, an echo of the M9.0 from March 2011. I posted a map showing the 949 quakes over M5.0 we've experienced since then and had several questions asking where did I find the data. Very simple, soon after the earthquake a developer called Paul Nicholls created a real time map linked into the Japan sensor network; it became something of a hobby tracking the shocks as we were thrown sideways on a regular basis. Here is a follow-up image showing all 3,234 quakes (as of 5.00PM today) we've had the pleasure to host since then and if you'd like to follow this site just go to Japanquakemap.com. And thank you to Paul for creating this site. However, if you'd like to be a little more proactive following earthquakes in Japan then download this App, Yurekuru ("Earthquake Coming"). In the settings you can choose where in Japan you'd like to follow and the level of quake you'd be concerned about. Mine is set to Shibuya in central Tokyo and only alerts me for anything over M5.0. Below that doesn't seem too exciting these days. The system is linked again into the government sensor network. When an earthquake is detected it issues an alert across the entire data network and you'll receive a few seconds warning. A few seconds doesn't sound much but it's about the time it takes for you to stop watching TV and get to the children's room to ensure they're safe and not scared. At those moments ten seconds is akin to an eternity. And so if you're sitting in New York and have family in Fukushima, it will still work. And you can track when we're running to the kids' room to check they're ok and hopefully watching them quietly fall back to sleep.